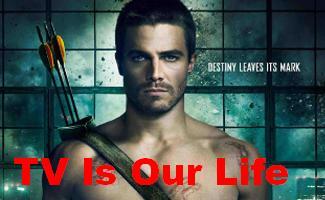 What Will happen on "Arrow"! The CW Arrow: "Lost Canary" - Monday, April 15 (9:00-10:00 p.m. ET) (TV-14, LV) (HDTV) BIRDS OF PREY; CAITY LOTZ GUEST STARS - Promo - After being accused of murder and having her criminal past exposed, Laurel (Katie Cassidy) goes full Black Siren and teams up with an old criminal acquaintance, Shadow Thief (guest star Carmel Amit), to go on a crime spree around Star City. While Dinah (Juliana Harkavy) aims to bring Laurel in, Felicity (Emily Bett Rickards) refuses to give up on her friend and tries everything to get through to her, even summoning Sara Lance (guest star Caity Lotz) for help. However, Laurel rebuffs all her efforts, forcing the former friends to face off against each other. Kristin Windell directed the episode written by Jill Blankenship & Elisa Delson (#718). Original airdate 4/15/2019. LAUREL TEAMS UP WITH OLIVER — Laurel (Katie Cassidy) learns about some damaging information that affects Emiko (Sea Shimooka). Always looking to protect his sister, Oliver (Stephen Amell) invites Laurel to help investigate, which makes Felicity (Emily Bett Rickards) happy as her friend is now working with the team. However, when things go awry, Felicity is forced to make a choice between the team and Laurel. Patia Prouty directed the episode written by Sarah Tarkhoff & Elizabeth Kim (#717). Original airdate 3/25/2019. FLASH FORWARD TO THE FUTURE - Mia (guest star Katherine McNamara) and William (guest star Ben Lewis) venture into the Glades on a dangerous mission. There they run into Dinah (Juliana Harkavy), Roy (Colton Haynes) and Zoe (guest star Andrea Sixtos) who deliver some devastating news. The flash forwards share highlights from Mia's childhood with Felicity (Emily Bett Rickards). James Bamford directed the episode written by Beth Schwartz & Oscar Balderrama (#716). Original airdate 3/18/2019. THE ELSEWORLDS CROSSOVER CONTINUES IN GOTHAM CITY WITH BATWOMAN (RUBY ROSE) - With Oliver (Stephen Amell) and Barry (guest star Grant Gustin) still stuck in the other's bodies, the two get a lead on John Deegan (guest star Jeremy Davies) and head to Gotham City with Supergirl (guest star Melissa Benoist) to figure out why their reality has changed. While there, they meet the mysterious Kate Kane (guest star Ruby Rose) who provides them with information that leads the group to Arkham Asylum. James Bamford directed the episode with teleplay by Marc Guggenheim and story by Caroline Dries (#709). Original airdate 12/10/2018. FELICTY DISCOVERS A SECRET ABOUT OLIVER; CURTIS GOES UNDERCOVER — Felicity (Emily Bett Rickards) learns something new about Oliver (Stephen Amell) that shocks her. Meanwhile, Diggle (David Ramsey) asks Curtis (Echo Kellum) to go undercover for ARGUS. Dinah (Juliana Harkavy) works with an unlikely ally. Mark Bunting directed the episode written by Benjamin Raab & Deric A. Hughes (#705). Original airdate 11/12/2018. RULES ARE MADE TO BE BROKEN — Oliver (Stephen Amell) makes a drastic move in his quest to find Diaz (Kirk Acevedo). Like her husband, Felicity (Emily Bett Rickards) pulls out all the stops to get to Diaz. Meanwhile, when arsonists target Rene’s (Rick Gonzalez) community center, injuring Zoe (guest star Eliza Faria) in the process, the mysterious new Green Arrow swoops in to help save the day. Faced with pressure from the mayor to capture the vigilante, Dinah (Juliana Harkavy) must decide if following the rules at all costs is the best plan to keep the city safe. Ben Bray directed the episode written by Emilio Ortega Aldrich & Tonya Kong (#704). Original airdate 11/5/2018. CURTIS GOES UNDERCOVER FOR ARGUS — Still in prison, Oliver (Stephen Amell) faces his biggest challenge yet. Meanwhile, Felicity (Emily Bett Rickards) gets an intriguing offer, and Diggle (David Ramsey) asks Curtis (Echo Kellum) to go undercover for ARGUS. Gordon Verheul directed the episode with teleplay by Onalee Hunter Hughes & Sarah Tarkoff and story by Elizabeth Kim (#703). Original airdate 10/29/2018. LOCKED UP — Following Oliver’s (Stephen Amell) shocking decision to turn himself over to the FBI and reveal his identity as the Green Arrow to the public, Oliver has spent the past five months in Slabside Maximum Security Prison. Determined to keep a low profile to shorten his sentence for the sake of his family, Oliver is tested when he runs into old foes. Meanwhile, Diggle (David Ramsey) and Dinah (Juliana Harkavy) have taken on new jobs and left their costumes behind but not everyone is following suit. With her focus on William (guest star Jack Moore), Felicity (Emily Bett Rickards) tries to start over but when someone from her past resurfaces, things become complicated. James Bamford directed the episode written by Beth Schwartz & Oscar Balderrama (#701). Original airdate 10/15/2018. Our other pages for current news and spoilers: B&B, Days, GH, Y&R, general daytime, Big Bang Theory, Doctor Who, Elementary, Family Guy, The Flash, Gotham, Grey's Anatomy, Law & Order, Marvel's Agents of S.H.I.E.L.D., Nashville, NCIS, Once Upon a Time, South Park, Supergirl, Supernatural, and Teen Wolf.